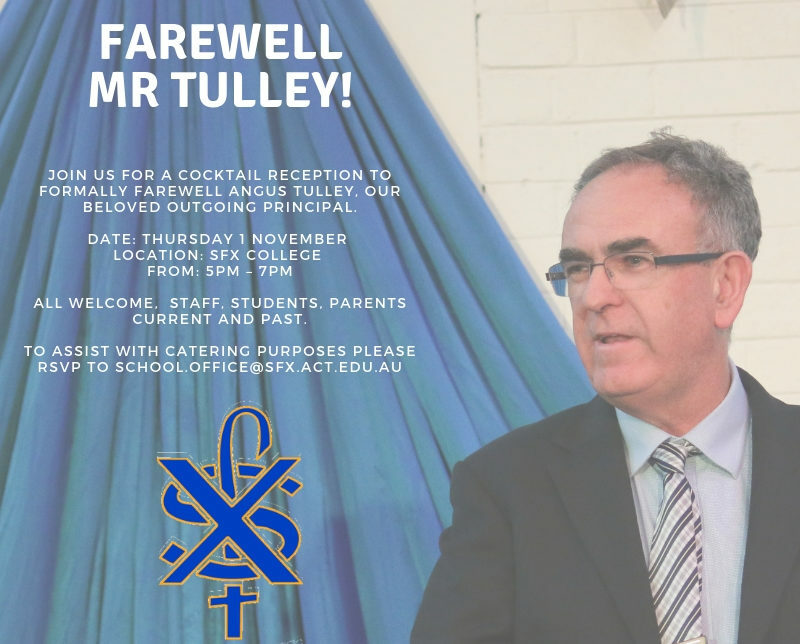 All staff, students, parents and alumni of St Francis Xavier College, Florey are invited to farewell Mr. Angus Tulley, who finished as Principal of the College this year. Angus was seconded to the Catholic Education Office as its Deputy Director at the start of this year after 15 years as Principal of SFX. Mr Tulley will be honour on Thursday 1 November at the College from 5pm – 7pm with a cocktail reception for those who want to wish him well. To assist with catering purposes please rsvp to school.office@sfx.act.edu.au. Similarly if you wish to send him your best wishes, please also be in contact with us.